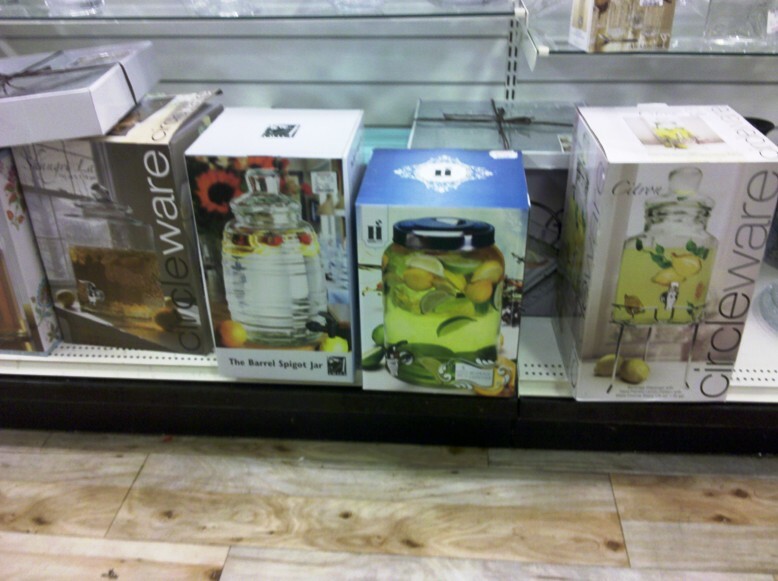 I was so excited with what I bought of this shopping spree that I wanted to share that with you first. Let’s take a closer look at each of the planters. I absolutely loved this planter for it’s color and texture. It just called out to me. This pretty one just called out my name. I have been loving yellow lately and really wanted to add more yellow to our outdoor space. It makes me smile. I have been looking for a new set of sheets for awhile now and I found this awesome geographic design one at HomeGoods. And I love grey. 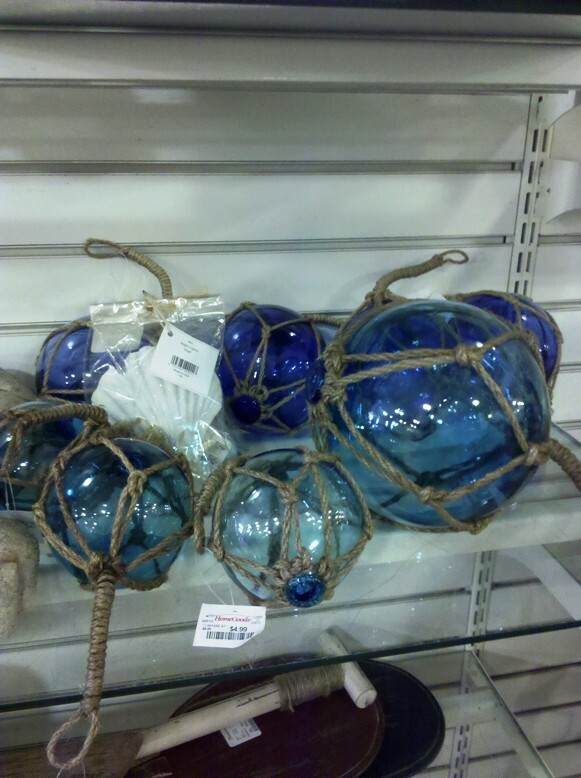 For years now I have wanted some Japanese Fishing Glass Balls. You can check out loads of Google images of these fishing balls here. They actually come in all different shapes, colors and sizes. I finally bought some faux coral. 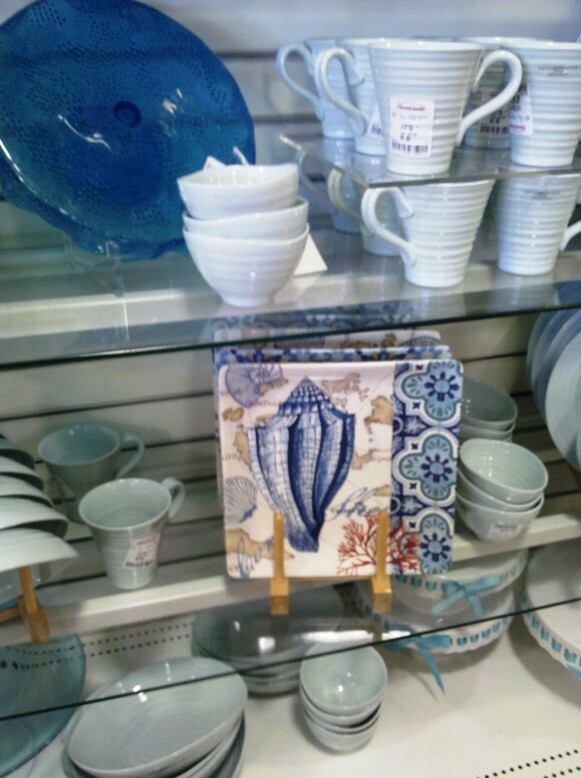 I have always loved beachy decor and now I have found a way to add just a little into my home. I have a few nautical pieces around the house as well. Some really old pieces from my Grandma’s house too. Love mixing the old with the new. Here is a better look at the glass fishing balls. I just love the rope netting that is around each one as well. It gives great texture to the smooth glass. Of course I had to figure out an awesome place to display the glass fishing balls and then I saw this lovely distressed wire basket. I love the look. Sort of reminds me of fishing cages. I’m going to add some fish netting to the bottom of the basket and I will probably use this as my centerpiece on my Dining Room table for now. Of course I needed a new table runner for the Dining Room table then. I think I see a new tablescape coming up soon. I have to pull some stuff together and see what works best. 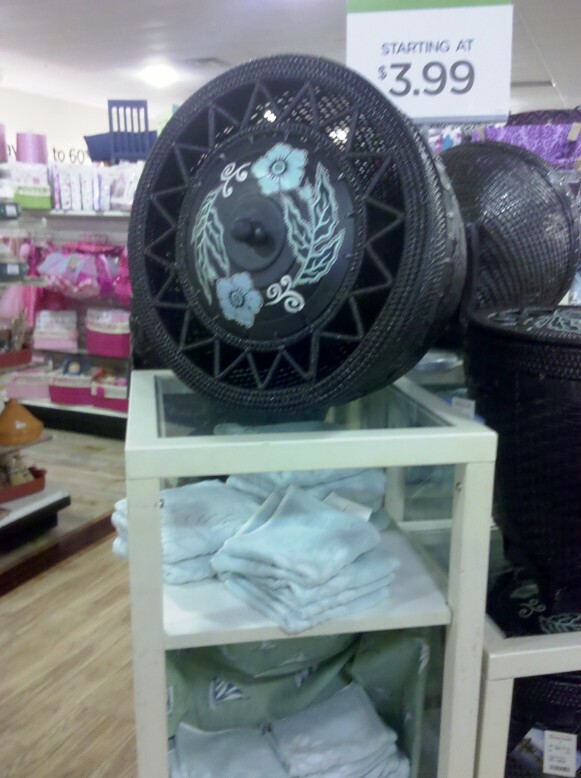 Not sure if these flowers will work well with the fishing balls and the basket. We shall see. I have to play around with a few ideas first. Gorgeous right? Love the blue/green/yellow combo with a touch of brown. 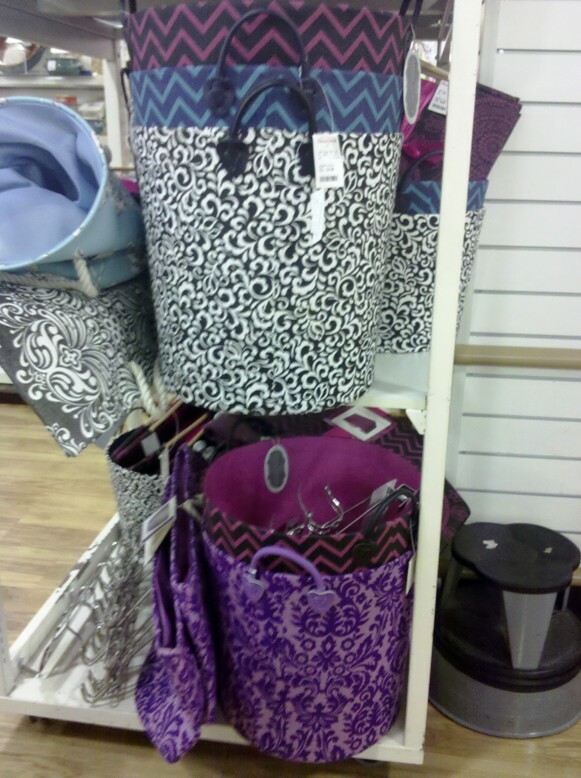 Now onto my pictures that I took while shopping. I had to give you more eye candy then just what I bought that day. I want to apologize first for the bad cell phone pictures. It’s what I had with me for this trip. 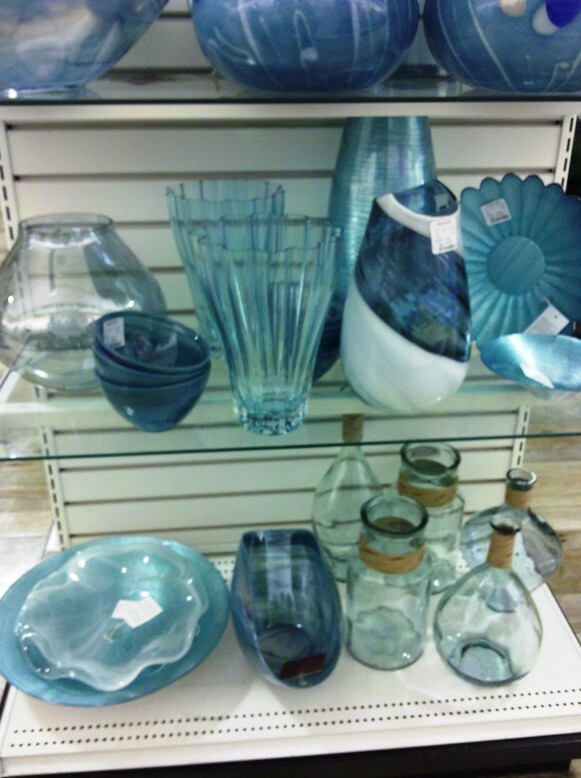 This dinnerware set was a nice light blue. It was gorgeous in person. 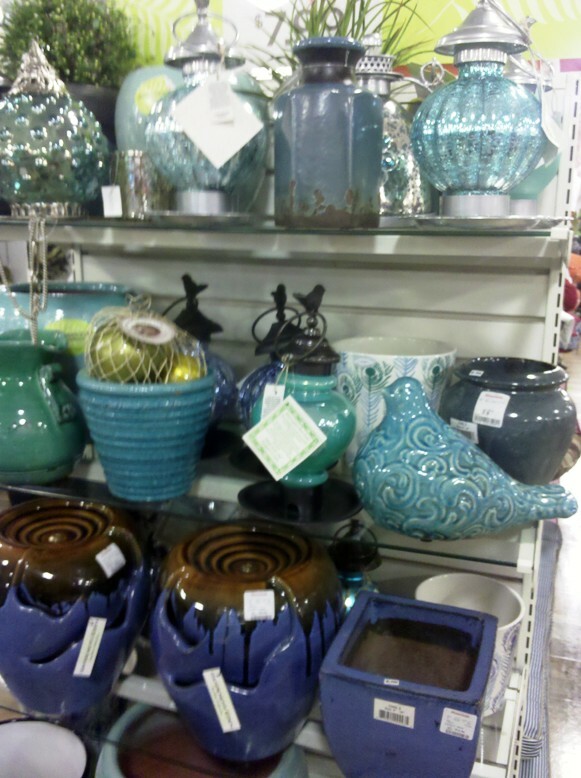 Looks like hand made pottery. 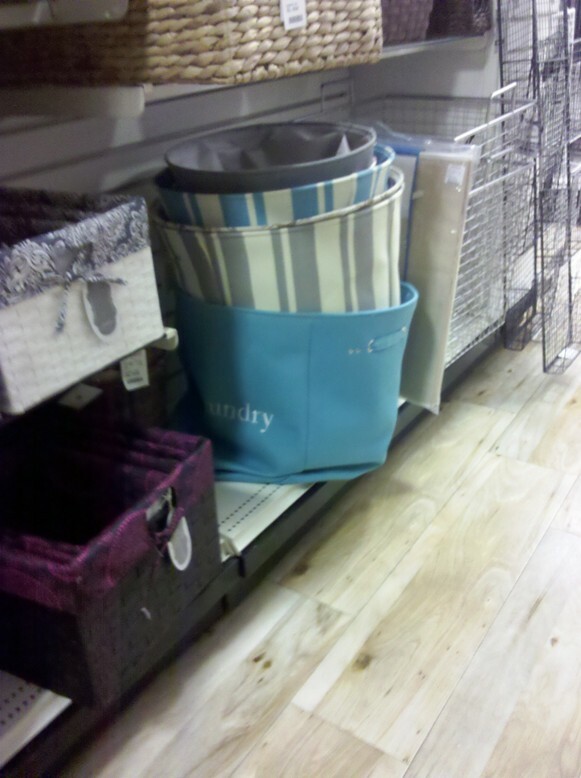 I believe this was some sort of laundry hamper. Nothing too big, but it was pretty in person. Here we have the outdoor section. 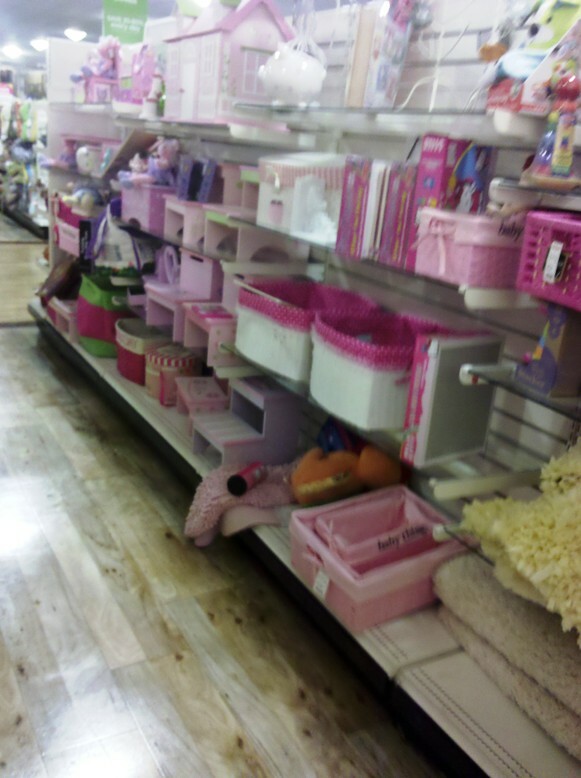 I could have bought some many things from this section. I know I have to stop just looking at the blue decor. haha. It’s just such a calming color to me and I’m always drawn to it. 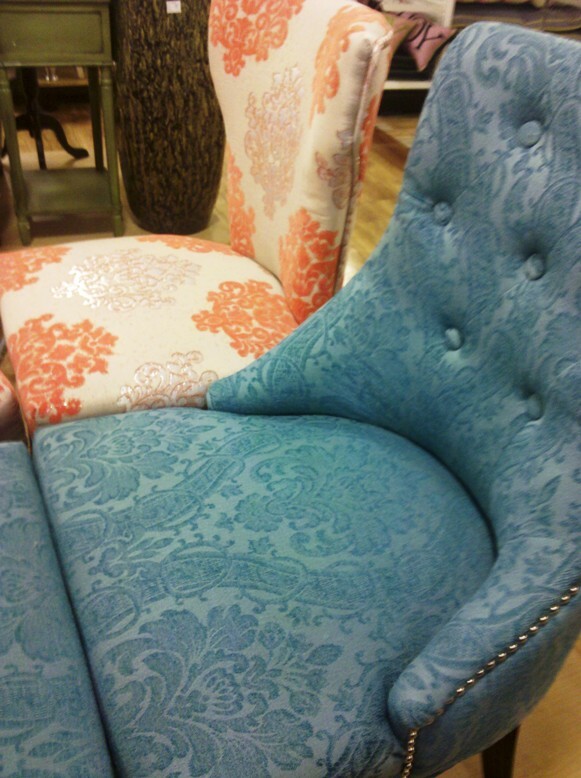 These chairs were gorgeous. The turquoise color in person was to die for. Gorgeous glossy white trim. Wish I had a place in my house for them. 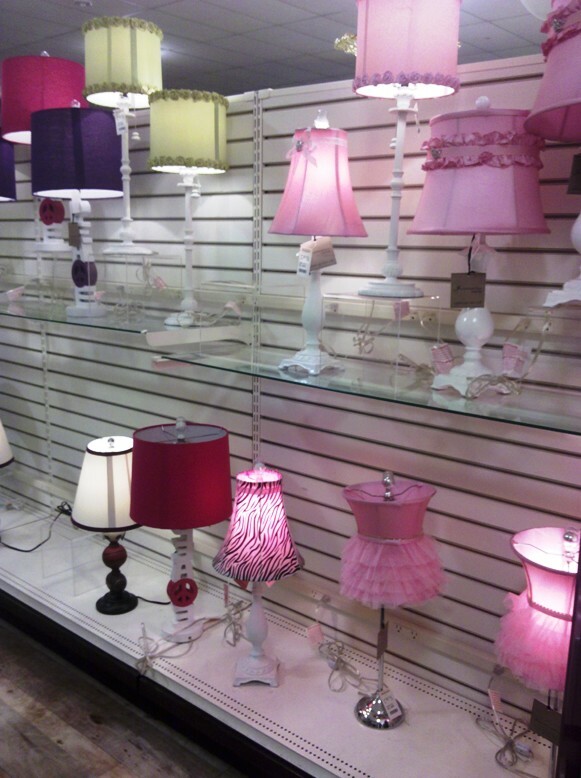 Some gorgeous lamps. 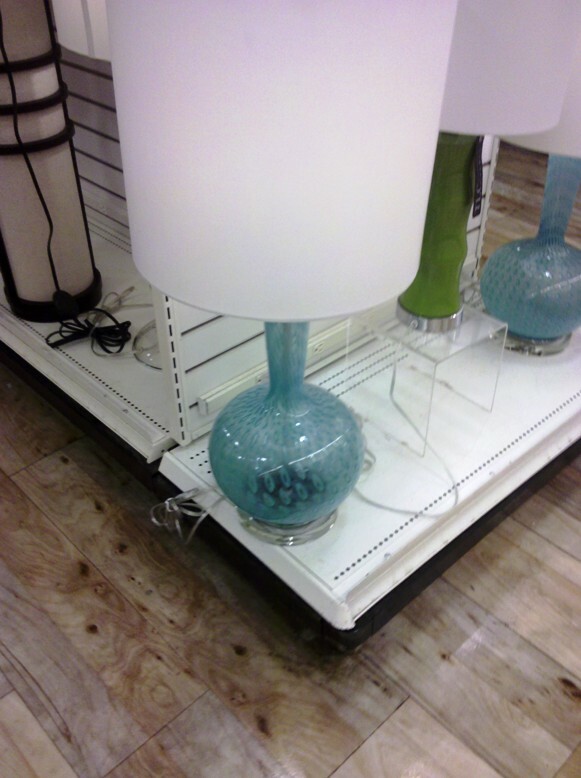 These lamps were so cool. Lots and lots of ottomans. So many to look at. Some great prices too. 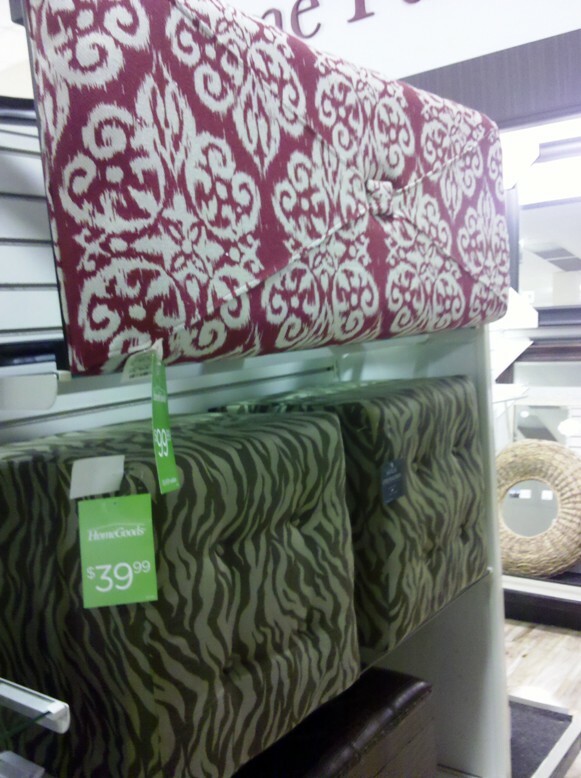 I wish I had a place in my home for this Ikat ottoman. Gorgeous…just gorgeous!!! 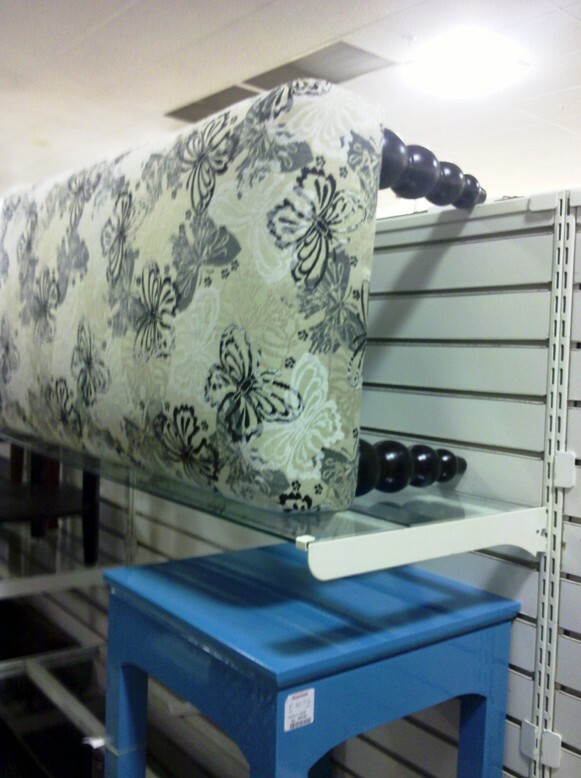 Love the legs on this ottoman!!! 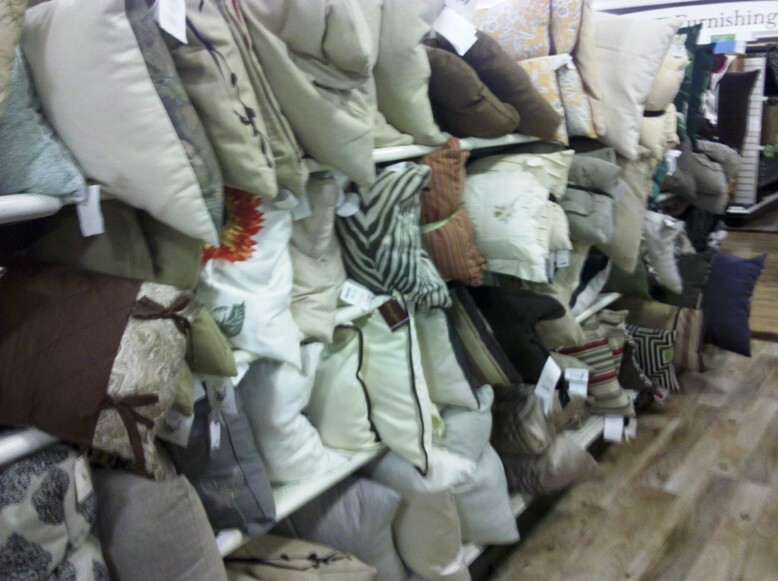 Hello pillows and more pillows and more pillows. 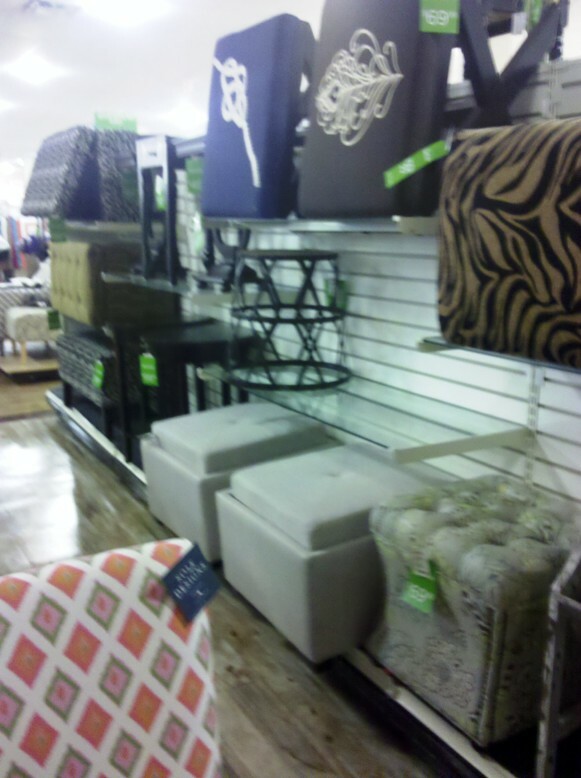 HomeGoods always has a great selection. I thought these glasses were so cute. 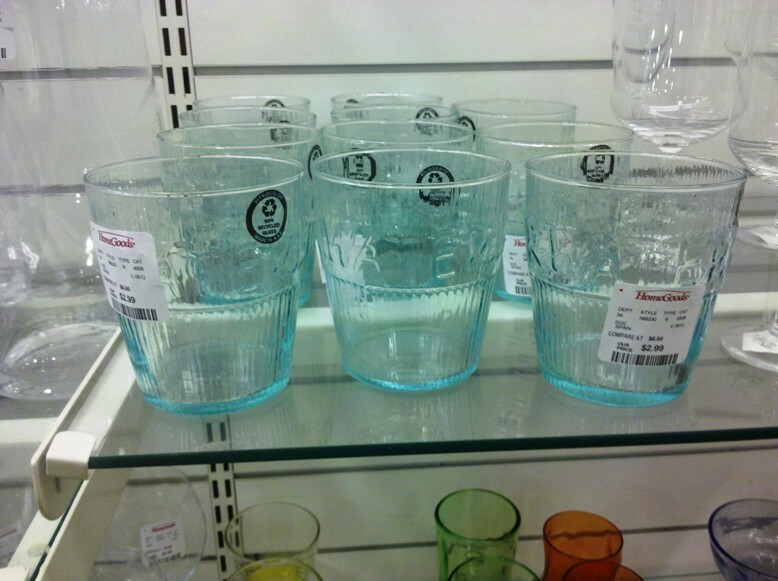 The word “water” was etched in the top of these glasses. 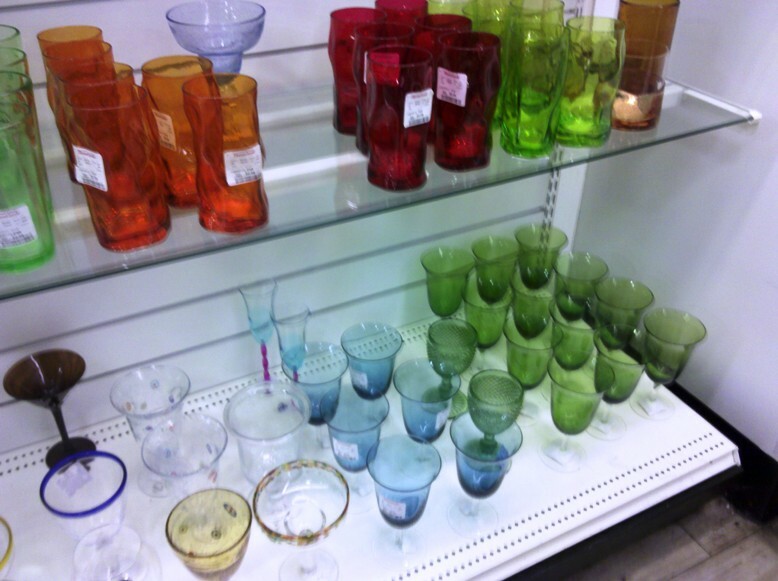 And if light blue/green glasses aren’t your thing, they have these gorgeous jewel tone glasses too. 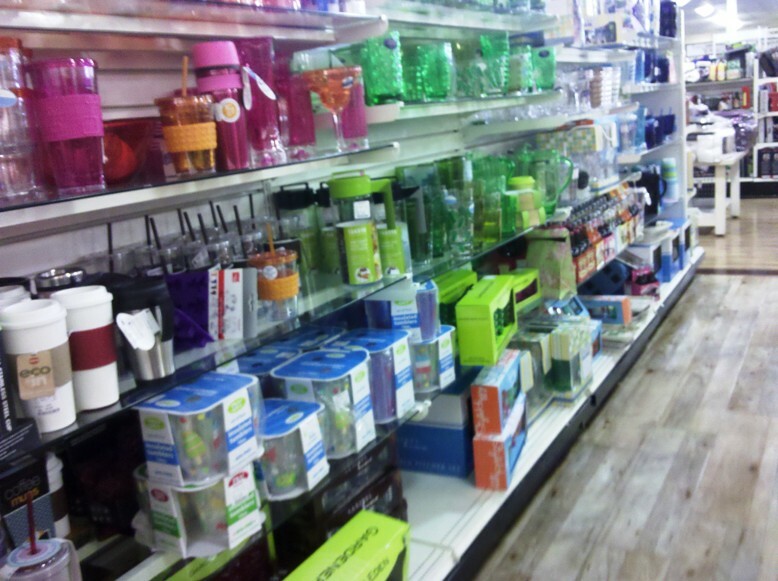 They had a whole isle just for melamine glasses and plates. Great for summertime. Now lets look at some kids stuff. 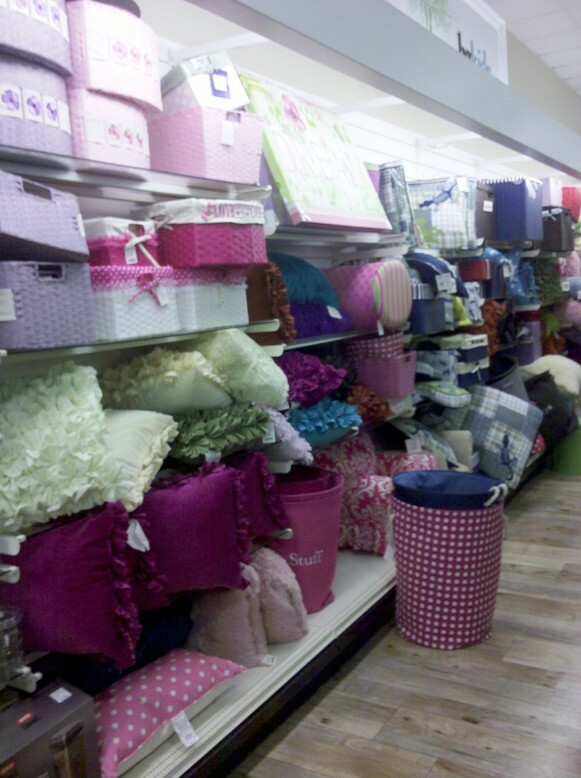 Lots of pillows and baskets. 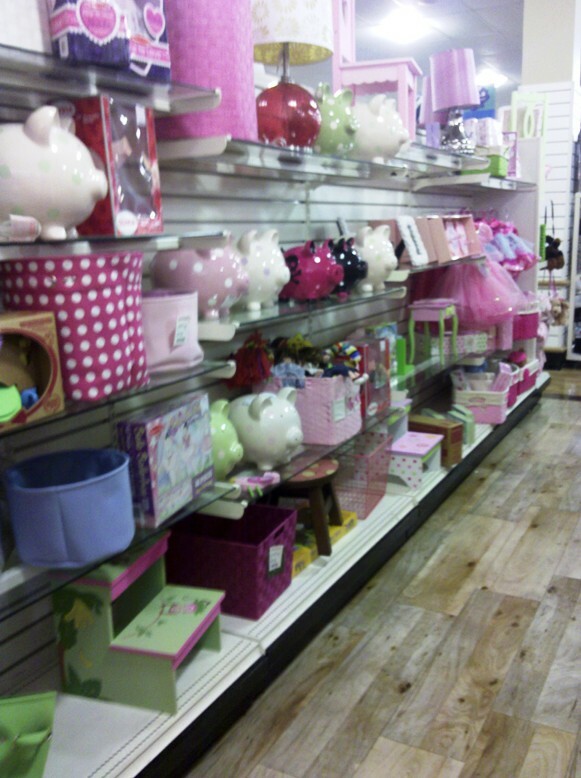 Lots of fun stuff for kids. 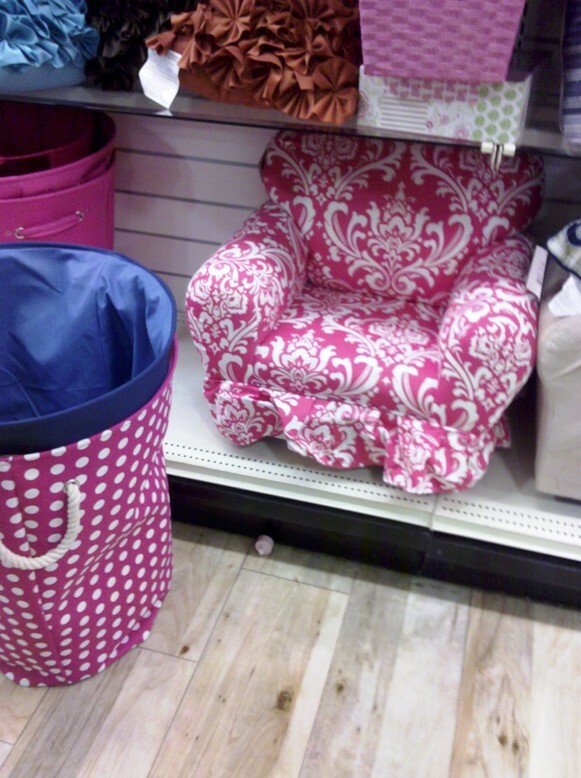 Isn’t this little girls chair adorable? 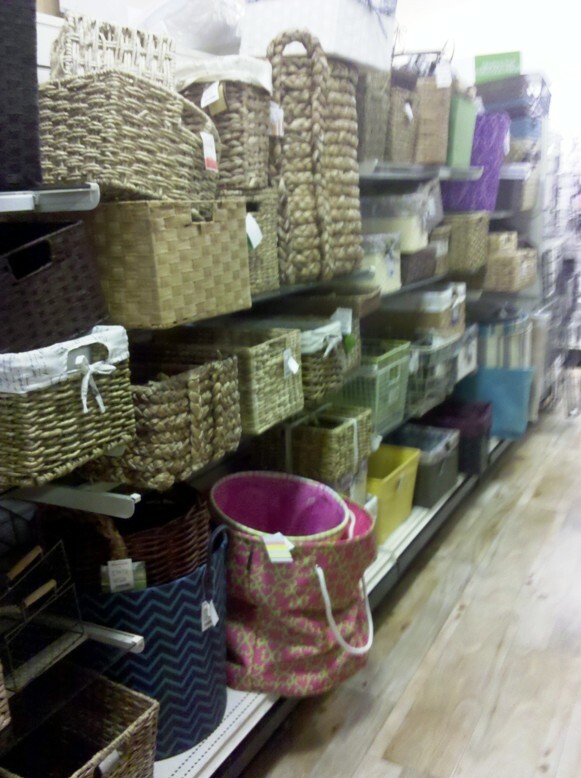 If ever looking for baskets, they have lots and lots of them in every size, type and shape. 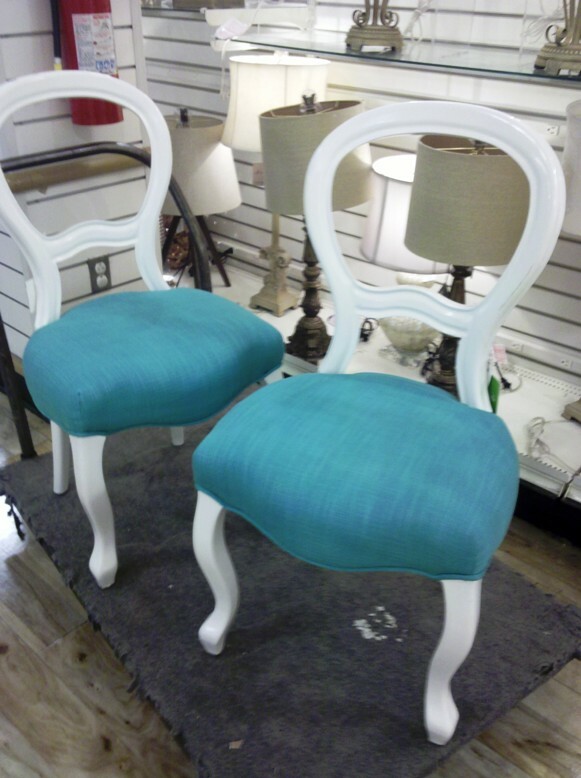 All I can say about these chairs is “Oh My Gosh…GORGEOUS”!!! I was drooling and wished I could take them home with me. 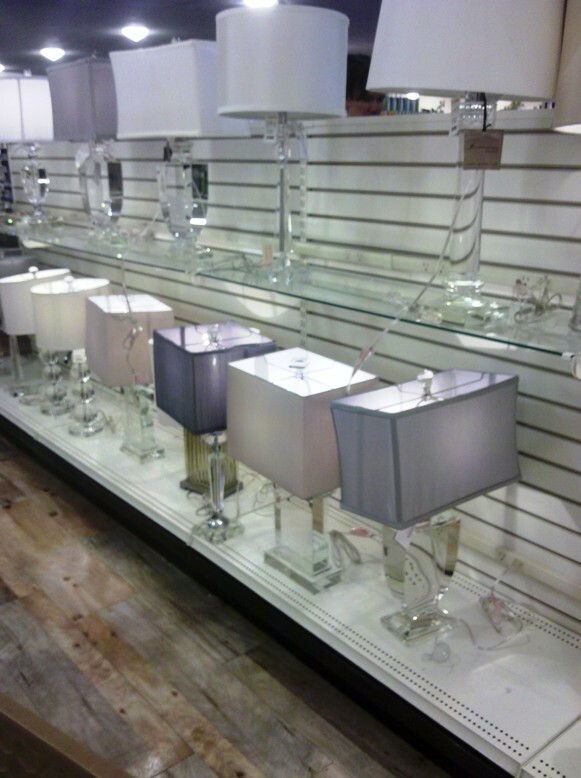 Can’t forget about their lamp section. Always an area to drool over. 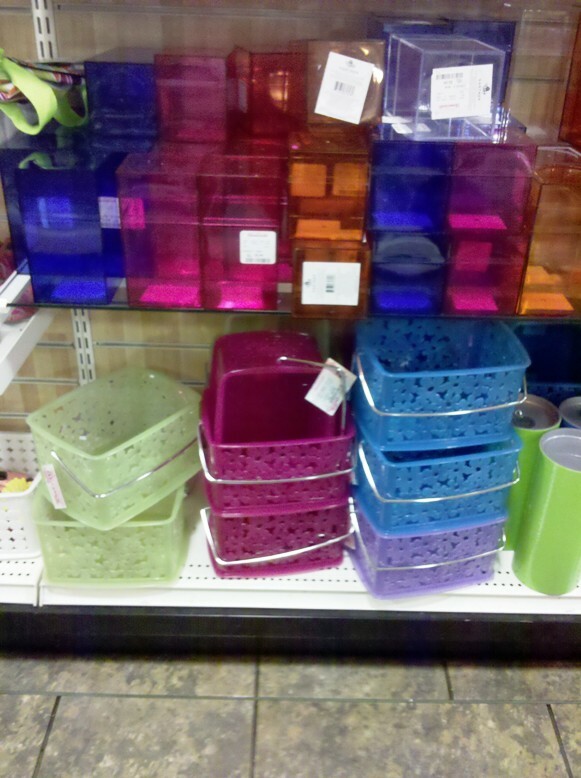 These are just some of what HomeGoods carry. Well that was the end of my shopping spree. 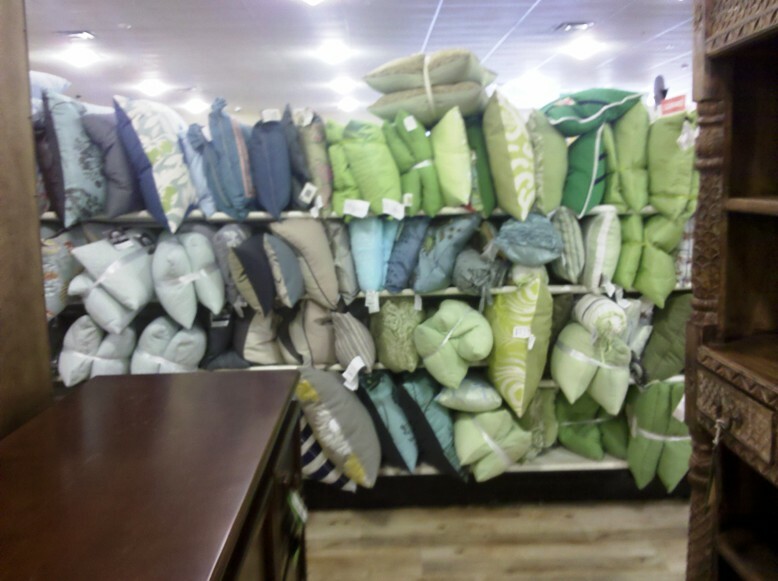 So who has been to HomeGoods recently? What did you buy? What did you drool over? I’m extremely lucky to have around 5-6 stores in my area. Love everything you bought!!! Do you happen to remember how much the damask little girl's chair was?? Love it! ( although probably gone by now!) Table runner has great summer colors! Can't wait to see the gazebo all finished.